The cashew tree is a tropical evergreen tree that produces the cashew seed and the cashew apple. Sometimes called nature’s vitamin pill, cashew nuts, are not actually nuts but seeds. They are a popular snack and food source. Cashews, unlike oily tree nuts, contain starch to about 10% of their weight. The shell of the cashew nut is toxic, which is why the nut is never sold in the shell to consumers. Here on this page, we will see some of the important health benefits of Cashews. Cashew nuts are grown in Central and South America. They are rich in unsaturated fats and other minerals. They are commonly made into the paste to be used for making curry in addition to other culinary uses. Many Chinese dishes use cashews with chicken and vegetables when making stir fry. Cashew, or “Kaju” in Portuguese, is one of the popular ingredients in sweet as well savory dishes worldwide. Nuts are commonly used in Indian cuisine, whole for garnishing sweets or curries, or ground into a paste that forms a base of sauces for curries (e.g., Korma), or some sweets (e.g., Kaju barfi). Adding cashews to your diet might be helpful if you suffer feelings of stress, fear and worry. This tasty nut is a powerhouse of good things for your brain and mood. All nuts and seeds contain beneficial fats, B vitamins and magnesium for a healthy mood, but cashews are one of the few actually linked to reducing not just anxiety, but also warding off general stress and even mild depression. Cashews are a tiny package of iron, magnesium, Vitamin B6, protein and important amino acids, and even omega 3 fats. All of these nutrients directly ward off mild depression and anxiety naturally. The tryptophan in cashews can boost your brain’s production of the feel-good neurotransmitter serotonin, which promotes a stable mood and healthy sleep. Tryptophan is a natural booster of serotonin, which is the antidepressant chemical that your brain needs. Without enough tryptophan in our system, we will feel anxious, depressed, and stressed. Cashews are also richer in magnesium which is critical to a healthy mood and nervous system, helping treat anxiety and depression. Also, cashew contain Vitamin B6 which on combining with trytophan work to create a relaxed, zen state that helps fight a sour or anxious mood. 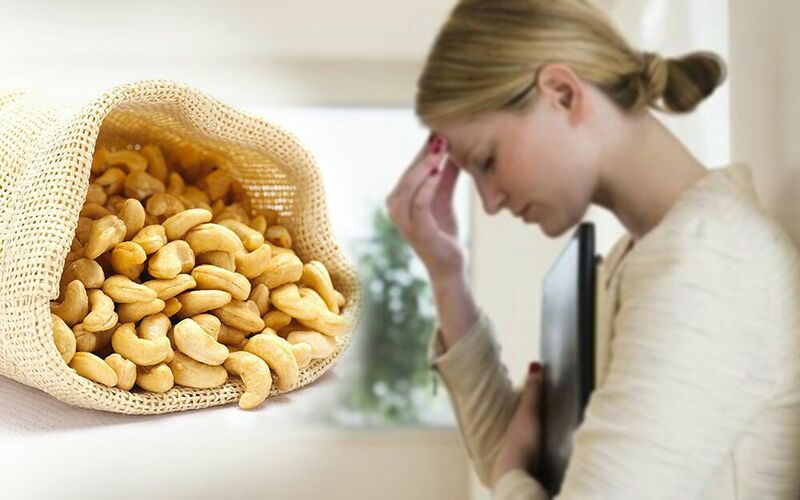 Depression is a serious mental health issue, not to be taken lightly, so please, don’t assume that eating cashews every day will in fact cure depression on their own. The cashew tree’s leaves and bark as well as the popular cashew apple, possess herbal health benefits that include killing bacteria and germs, stopping diarrhea, drying secretions, increasing the libido, and reducing fever, blood sugar, blood pressure and body temperature. 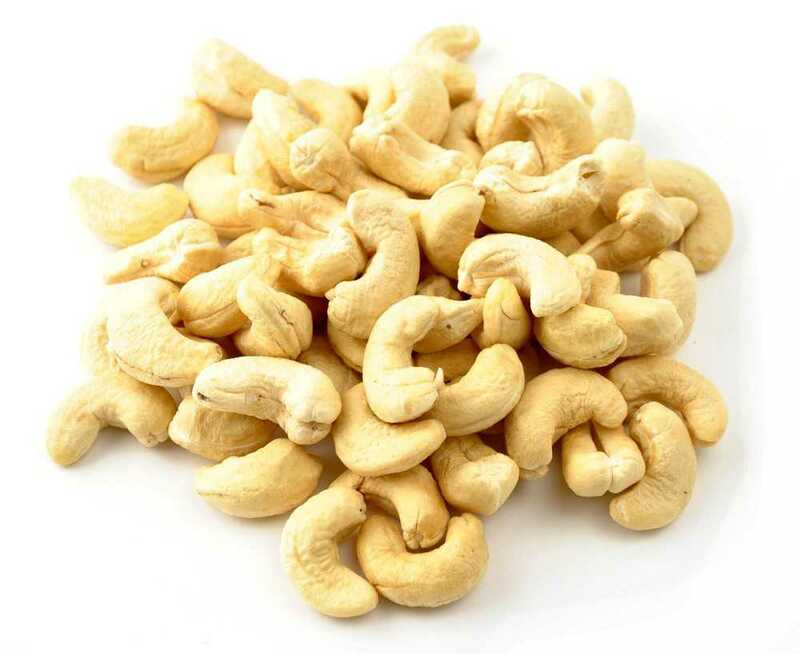 Cashews are also good in many essential vitamins such as pantothenic acid (vitamin B5), pyridoxine (vitamin B-6), riboflavin, and thiamine (vitamin B-1). 100 g nuts provide 0.147 mg or 32% of daily recommended levels of pyridoxine. Cashews can be a healthy addition to a balanced diet. One serving, or 1/4 cup, of cashews, contains protein, beneficial fats, and minerals. The nuts are relatively high in calories, so portion control is key to achieving your nutrition goals. Cashews naturally contain iron, magnesium, phosphorus, potassium and zinc. Iron carries oxygen throughout the blood; magnesium, phosphorus, and potassium function as electrolytes to keep fluid in your body balanced; and zinc strengthens your immune system. Cashew nuts also have a fatty acid profile that contributes to good health through phytosterols, tocopherols, and squalene, all of which lower the risk of heart disease, combined with the nut’s zero percent cholesterol content. Recent clinical trials have shown that cashews and other nuts work with a person’s lipid profile to have a beneficial effect on those with diabetes or at risk for diabetes. How much quantity should be consumed per day?